We get to read about and see an abundance of project builds through online channels, but we especially love when we get the opportunity to meet the makers themselves as they share their projects first-hand. That’s why an event like Maker Faire continues to be so successful. It provides a platform and a dedicated space, if only for a weekend, for makers and tinkerers alike to come together and share with other enthusiasts. 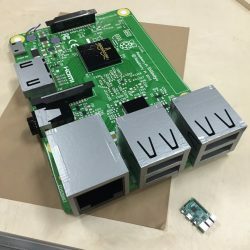 If you didn’t make it to this year’s Bay Area Maker Faire to see the thousands of maker projects, here is a roundup of our favorite Raspberry Pi projects from the weekend. Flaschen Taschen is a massive video display made out of beer bottles, milk crates, and RGB LED strings. The display is reminiscent of a Lite-Brite (remember those?) only this one is taller than you and a tad more sophisticated. Each bottle is capped with a single addressable RGB LED. The bottoms of the bottles act as lenses for the emitted light. The colors resemble those of a thermal camera, and they move like amoebas under a microscope. The sheer size of the Flaschen Taschen is what initially caught our eye. After we learned the details of its construction we were even more intrigued. The entire display is driven by a Raspberry Pi and some custom circuitry. The art installation is a great example of upcycling, using everyday items to create something beautiful and thoughtful. The project name is a nod to c-base’s Mate-Light project. 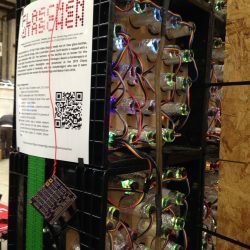 Check-out their Github repository for more details on the design and project documentation, and enjoy this video of the setup from Hackaday. 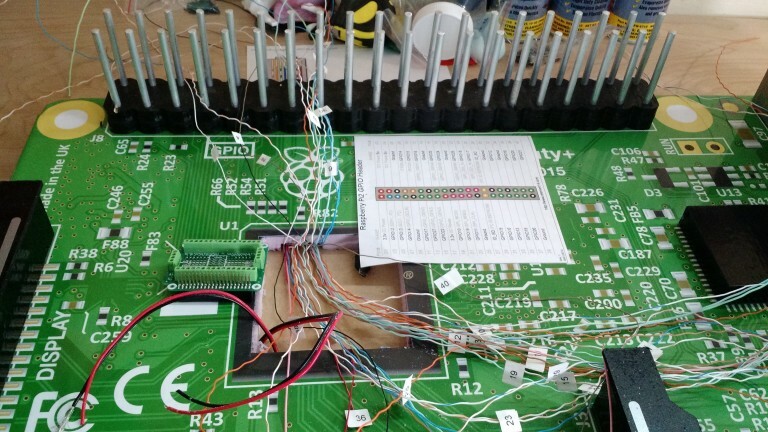 The members of Noisebridge Hackerspace in San Francisco went all out this year, building a 1,575 pixel display for their booth at Bay Area Maker Faire. The pixels are Corona Beer bottles, 25 to a crate stacked 9 crates wide and 7 crates tall. While MCM’s enlarged Raspberry Pi may have looked like a prop from the 1989 movie Honey, I Shrunk the Kids, it was also fully functional. The Raspberry Pi Infinity+ is ten times the size of a Raspberry Pi Model B. It was made by our friends Michael Castor and Christian Moist over at MCM Electronics, an official distributor of Raspberry Pi. It’s hard to say what was more captivating: the GPIO header, the USB ports big as one’s head, or the precise detailing of the board’s components illustrated from high-res photos into Adobe Illustrator. But, because they are true maker pros, Michael and Christian were sure to document the complete build process. You can find the detailed BOM and design notes on each of their personal blogs. Not all makers stand behind a table or in a booth at the faire. Many take to the fairgrounds with projects in hand. You’ll often see the natural congregation of people around makers carrying their projects, who are happy share the story of their build process again and again as they themselves make their way around the faire. This was just how we met Jonathan, a young maker, and his father. Jonathan—proudly gripping his homemade Game Boy—stopped by the Raspberry Pi booth, and we are sure happy he did. The Game Boy replicated the classic handheld version but swapped out the matte plastic grey case for a handmade wood enclosure, and Jonathan gave it his own personal touch by adding customised operation buttons. Though the attention to detail and design were impressive, the best part of this project was that it transformed a typically siloed activity on a personal device, turning it into a participatory build for a father and son. That is precisely the sort of making that we love to see happening around the Raspberry Pi. Loved this recap – thanks RaspPi team! I’m jealous that I didn’t make it out to San Mateo this year – it looks like it was another amazing event! I want the display. Just need to empty 9*7*5*5 botles … which is only uuh oh wait, i want a small one. Idea : If one makes a horizontal 3 x 3 it could make some sort of tic tac toe table. How to sense a bottle bottom touch ? Anyone with idea’s ? Clear Touch Panels over the each crate as inputs for which square is selected. Was that display playing the game of “Life”? It appeared so.